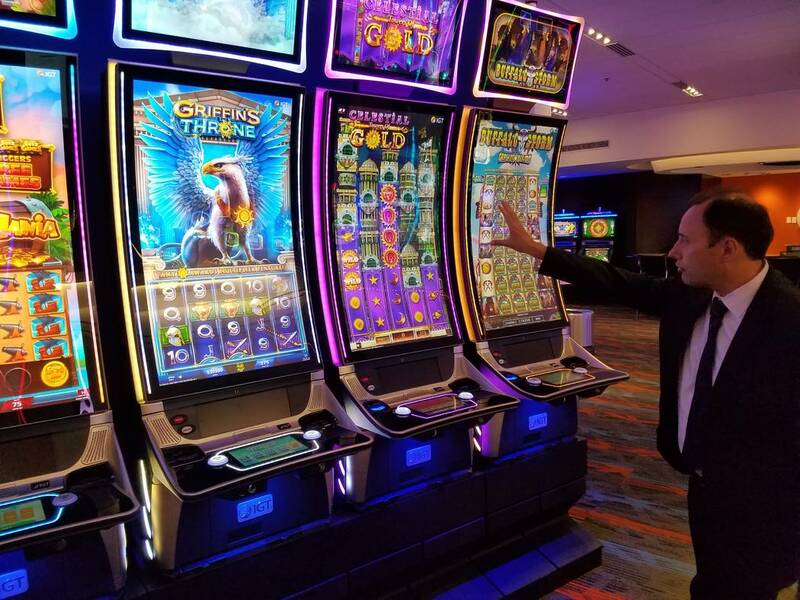 The floor of the Global Gaming Expo opened Tuesday, Oct. 9, at the Sands Expo and Convention Center; and for Las Vegas gaming suppliers this is their chance to show the rest of the country and world the latest in technology and services. Almost 400 booths, many of them featuring companies from Las Vegas, will be part of the exposition that runs through Thursday with more than 26,000 people in attendance. Wilson said about 300 to 400 customers from around the world will come through the booth and view more than 300 games on the floor. About 100 Aristocrat employees will be at the show, which Wilson said is the biggest ever for the company. Aristocrat is unveiling new slots called Showtime’s Billions, Motown and Mad Max: Fury Road. Las Vegas slot maker Scientific Games will unveil a series of James Bond games from movies “Die Another Day,” “GoldenEye,” “Live and Let Die” and feature Dutch actress and Bond girl Famke Janssen — all to get the attention of customers and the public, who will ultimately play the slots. Engaged Nation, a gamified marketing company, is celebrating its 10th anniversary this month and is unveiling 14 new games at G2E and 40 more by the end of the year. The games that are played online serve as digital marketing for casinos and use virtual currency as part of an effort to lure people to the properties. With the proliferation of sports betting around the country since the U.S. Supreme Court struck down a federal ban in May, companies like Engaged Nation, are counting on its platform to help casinos cultivate and lure sports bettors even before a state legalizes it. The company has acquired Gaming Today, a gaming publication, and will combine their efforts to grow sports betting. Like Aristocrat, this will be the company’s largest booth at G2E. 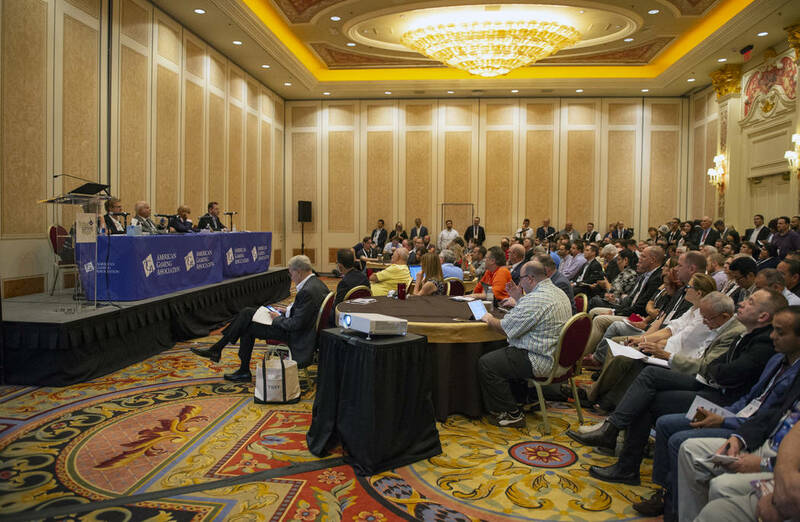 “G2E is by far the most important show of the year for virtually anyone in the gaming industry whether they’re are on the operator side or the vendor side,” said Engaged Nation CEO Jerry Epstein. Epstein called it “a great opportunity to introduce ourselves and new products to the marketplace, “especially this year in particular since they offer a sports-themed program. Sports betting is a big theme at this year’s educational conference with the subject on the main stage. It features speakers like ESPN anchor Scott Van Pelt, and Engaged Nation is the sponsor for his keynote address on the future of legal and regulated sports betting. “From what we understand there’s going to be companies coming in from all over the world more so than ever before and it will be the largest and most well-attended in the history of the show,” Epstein said. Engaged Nation is offering a sports tutorial that casinos can use to help educate their customers on sports betting in a fun way, Epstein said. It also offers picking the winners contests and skill-based games on sports. Their program has already helped a New York casino, where sports betting isn’t legal, develop a database, he said. Betting has been expanded to New Jersey, Delaware, Mississippi and West Virginia. It will also start up in Pennsylvania. Another Las Vegas company, JCM Global, hopes to take advantage of the newfound market for sports betting. The company makes software for slot machines that turns them into a kiosk where someone can place a sports bet without having to wait in line. JCM’s booth this year resembles a sportsbook with monitors that show games and betting odds just like your favorite casino. It sells the displays for sportsbooks and other uses such as nightclubs. Tom Nieman, JCM’s vice president of global marketing, said he’s expecting a big year for selling the displays in the wake of the expansion of sports betting. Potential customers are already gearing up and investigating what they need with legalization, he said. JCM has about 160 employees in Las Vegas, out of 700 corporately.